The Governor was joined at the press conference by Brendon Anthony, Director of the Texas Music Office, Mike Steinberg, Executive Vice President of BMI, and Nick Shuley, President of the non-profit Austin Music Movement. The Texas Music Office and Austin Music Movement played integral roles in BMI's decision to expand its presence in Texas. 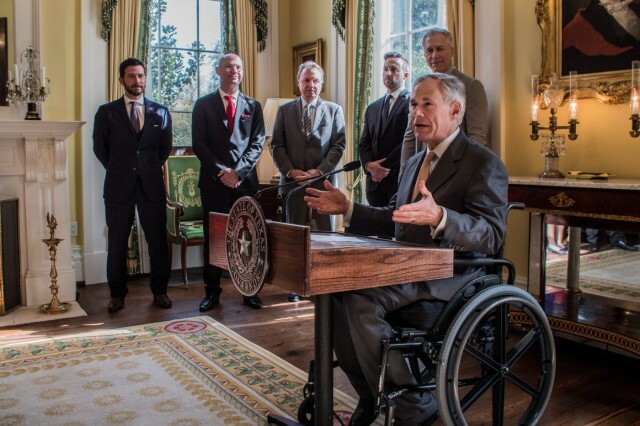 "With the opening of this new creative office, BMI’s support of musicians and music publishers in the Lone Star State will become even more Texas-focused," said Governor Abbott. "This investment will help bolster Texas’ status as a cultural and economic center for the rest of the nation. We are excited about this partnership and look forward to working with BMI to grow their presence here in Texas while continuing to develop and attract great musical talent here in Austin and throughout the state." The new creative office will allow BMI to work directly with songwriters, composers, and other music professionals in the Austin music community to help enhance their ability to earn a living in the industry. The office will be led by Texas native Mitch Ballard, Senior Director, BMI, Austin under the direction of Jody Williams, VP, Creative, Nashville and Mason Hunter, AVP, Creative, Nashville.